This delicious carrot side dish is so easy to make with the addition of KRAFT Dressing and fresh parsley! 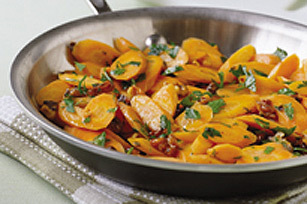 Cook carrots in dressing in large covered nonstick skillet on medium heat 10 min., stirring after 5 min. Stir in parsley and nuts. Substitute 2 tsp. parsley flakes for the chopped fresh parsley. Serving a crowd? Just prepare as directed, doubling all ingredients. Makes 12 servings. Toast nuts for a few minutes in an ungreased skillet on medium heat, stirring frequently just until lightly browned.